Providing unique and fresh content on a blog is the major deciding factor in the success of a blog as they say “Content is King”, and many successful bloggers are actually making a fortune out of their hard work. For this reason, blogging is chosen by many people as one of the best possible ways of earning online which has caused new blogs sprouting up every other day belonging to various niches. Monetization of a blog is in various forms like Pay per click, selling ad space, Pay Per View etc. Pay per click is one of the most used methods of monetization but for blogs covering events and special occasion’s videos having lots of visitors, Pay per View can also be beneficial albeit it is not very famous among the blogging community. The WPdeposit plugin will help you run a monetary system on your WordPress website. It allows your users to deposit money into their account and spend them out on advertisement, subscription and other … It is pretty similar to the way Envato marketplace members deposit money and buy items. The plugin will also provide tools to send money from a user account to another or admin options to edit deposits of a specific user. The WPD -PayPerView is an add-on for WPdeposit that enables site owners to let users/visitors pay for every view of a post/page. This easily customizable plugin comes with a lot of useful features. Some of them are: Protection of content and images, accept payment and subscriptions, social media login, PayPal friendly. 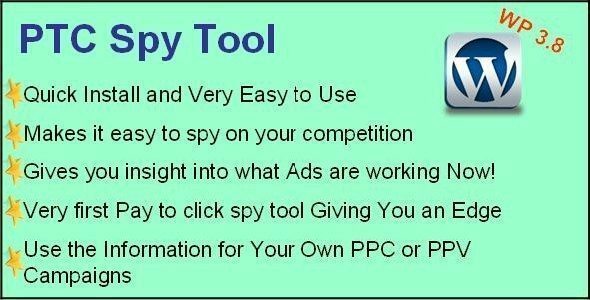 Revolutionary Plugin Spies on Your Competition and Shows You the Latest Paid to Click Ads That Will Give You an Unfair Advantage in Business. Have you ever wondered how some ads just seem to be a hit with the prospective customer? You keep seeing them. Another pay per plugin is created by Cleeng which is very easy to use and is available worldwide. It is designed to give its users flexibility in connecting with your fans and to promote your event. Pre booking facility is also available in this plugin. Another important featyre is that if your event is free it is also free otherwise you will be charged a small amount from your sales. Another multifaceted plugin. Lets you sell digital downloads, videos, music, photos, subscriptions, tickets, serial numbers, web hosting, collect membership fees, and much more. Secure download manager and easy streamlined checkout. The best part is that it gives you a multisite license. A simple yet effective plugin providing you with the ability to monetize your content in minutes. You can cash any type of content whether it’s a blog post, a site subscription, a digital download, or even a pay-per-view video. It also accepts very small amounts of payment and wide variety of payment methods. A WordPress certified subscription plugin enabling publishers, managing multiple publications to charge users and add customization according to their needs. Url Keywordz! Is A Time Saving Tool Designed For Cpv – Cost Per View, Also Know As Ppv – Pay Per View Marketers To Quickly And Easily Develop Highly Targeted Domain Name Based Keyword Lists. If you have experienced any other awesome plugin other than these feel free to tell us about it in the comments section below.